I was sixteen-years old when I was going through the Confirmation program. When it came time for me to pick a saint, I was torn between all the single saintly ladies: Teresa of Avila and Catherine of Siena were my top picks, but so were Agnes of Rome, Maria Goretti, and Cecilia. Joan of Arc is cool, but Lucy of Syracuse is like a sister to me. Then there’s my parish patron Kateri Tekakwitha to consider, but then again, Faustina Kowalska is the patroness of the Divine Mercy! AAAAHHHHH!!!! As you can see, I was quite stressed. So many awesome ladies to choose from and I only had so much time. I remember flipping through my Saints book in a panic. I ended up dropping it and watched it cracked open on the tile. When I picked it up, I saw the page on Saint Monica. I skimmed through her chapter, “She doesn’t seem very interesting.” She wasn’t a soldier like Joan or a martyr like Lucy, Maria or Agnes. I put Monica on the backburner for a while. At first glance, Monica and I were incompatible as candidate and patron. She was a married woman. I am single. She lived in Africa. I am a born-and-raised California girl. She was an obedient old woman. I am a headstrong young woman. In spite of all these differences between us, I couldn’t bring myself to click out of her info page just yet. So I sighed and took a second look at her story. 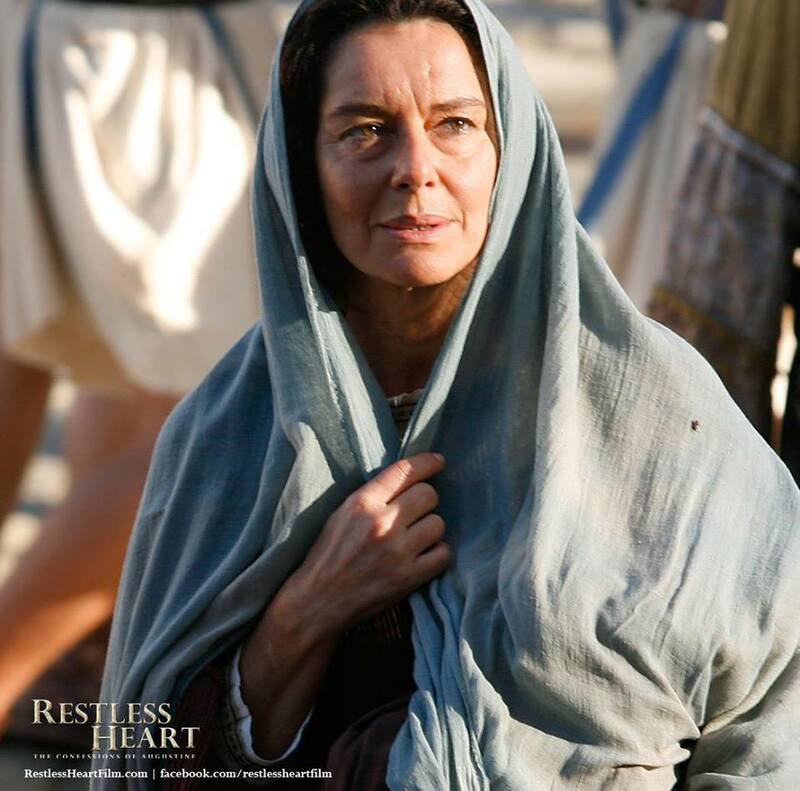 Saint Monica portrayed by actress Monica Guerritore in Restless Heart. Saint Monica was born in 331 AD in Tagaste, which is now known as Souk Ahras, Algeria. Not much is known about Monica’s childhood, but we do know that she was born after Constantine legalized Christianity. You may have noticed that in a lot of my Saints bios, many of these guys and gals were either in arranged marriages (ex. Cecilia) or were arranged to be married to somebody (ex. Lucy). Monica is no exception. She was twenty-two (a year younger than me) when she was betrothed to a Pagan man named Patricius. By all accounts, Monica was a generous and obedient girl, so she was married off without hesitation. To put it simply, Monica got a pretty raw deal because Patricius was the biggest jerk in Tagaste. Violent, with an explosive temper, he verbally and physically abused Monica during his outbursts. To add insult to injury, he was the kind of guy who would be a regular Ashley Madison customer if he lived in the year 2015. Oh, and did I mention that his mother/Monica’s mother-in-law also worse than Nurse Ratchet from “One Flew Over the Cuckoo’s Nest?” Needless to say, the apple didn’t fall far from the tree. Now, you’re probably thinking, “Ditch this guy, Monica,” but divorce court wasn’t a thing in AD Tagaste. These were the days where a man could leave his wife if she wasn’t a virgin, but a woman was stuck with a hot-headed cheater. Monica was a Christian and she was especially drawn to Christianity’s emphasis on kindness and humility. She was also very smart, so she figured that if she couldn’t leave Patricius, she would kill him with kindness. She knew she couldn’t fight back when he hit her because she would end up on the streets as a beggar woman, so she said her prayers aloud, ignoring him as he stormed off. When he came home after visiting one of his “lady friends,” Patricius scratched his head when he saw a lavish meal prepared for him by the wife he was betraying. Monica’s charitible approach won over Patricius’ respect and admiration, to where his punches became less frequent and he began walking out of the room instead of screaming at her. Monica had three children with Patricius; Augustine, Navigius and Perpetua. There’s very little info on Navigius and Perpetua (I did find out that Navigius entered the monastery), but Augustine–oh, yes–there is a plethora of info on Augustine. Why? Because her Augustine just so happens to be THE great Saint Augustine of Hippo. What a twist! Monica did the best job she could at raising her children in the faith, but remember, Patricius was an aggressive Pagan and it was his way or the highway. Augustine was the oldest son and it’s not uncommon for the oldest son to gravitate towards his father. This means that Augustine was very much his father’s son in his actions…and in his beliefs. Monica knew that her son was a fast-learner, but her heart broke when she saw how disinterested he was in her Christian faith. She was even more distressed when she realized that Paganism was more enticing to her impressionable son. When Augustine grew up, he traveled to Carthage. In those days, saying “I’m going to Carthage” was like saying, “I’m going to Harvard.” It was where all the great thinkers went to, well, think and trade abstract ideas. It was also where many heresies and questionable theological theories sprang up and resided. These ideas influenced Augustine and led him astray for oh-so-many years. To his chagrin, Augustine wasn’t alone. Right behind him on the boat to Carthage was his mother. Monica’s prayers finally paid off. Augustine had a powerful “come-to-Jesus” experience that changed his life. He abandoned his selfish ways and became a Christian. Monica could live in peace at last. She was called home to Heaven shortly after.